These photos are so funny that I had to bring them around for another post. construction don'ts for inspectors everywhere! this creative installation comes up with a whole new use for a traffic cone! OMG, Lisa... these are totally hysterical. But actually, I had a new construction home where they did just that with the tp holder... you would need the arms of an organutan... I made them move it! Thank you very much for sharing these photographs and for adding smiles to our faces. Haha. What the heck were they thinking when those bathrooms were designed? These are hysterical but you really wonder what could they have possibly been thinking? No common sense just get it done! Thanks for the chuckle this Friday morning. HI Lisa Von Domek - All I can say is Yikes! LOL! I am glad you enjoyed these Roy Kelley I love to share smiles! Thinking? I think that was was lacking Kat Palmiotti but we are kind to give them the benefit of the doubt! So true Dorie Dillard get it done, no matter what! Yikes! That one is in a class all its own, isn't it Barbara Todaro ?!! I agree Sheri Sperry - MCNE® Yikes sums it up nicely! Good morning Lisa. All I can hope for is to never find myself needing a bathroom in any of these places. Good morning Lisa. Some great opportunities for a space planner! Just saying! Enjoy your day! Good morning Lisa. This is really creative and oh so funny too. I guess there is always a way. Now that's how to put a positive spin on things Wayne Martin ! I agree Sheila Anderson creative and funny...but nothing we ever want to see in our homes! Those are photos of toilets that are not acommodating. Couldn't help the pun. Those are crazy and make me think that perhaps an outhouse or port a potty might have been a better option, haha. Hello Lisa --- "clever" solutions indeed. There's always something afloat. Lisa: All of these are hilarious and sad at the same time (crappy workmanship). Evidently common sense is not always so common. That was a good one Joe Pryor ! Have a wonderful weekend! Pretty unbelievable aren't they Brian England ?!! Clever indeed (LOL) Michael Jacobs but I am trying to not dwell on the "afloat" in your comment! It's just so wrong George Souto and there's no good spin for it! Oh how funny. I have actually installed a couple of toilets and it isn't easy lining them up with the waste line. This made me think of that adventure. Installing a commode can be a challenge Debbie Reynolds but I know that you or I would never stoop to these shortcuts! Good morning Lisa - OMG those are unbelivable. I can't imagine walking in on one of those. Sit very carefully Endre Barath, Jr. very carefully indeed! Oh my, now I HAVE seen it all! How funny and to imagine that people actually installed these and LIVED like this! 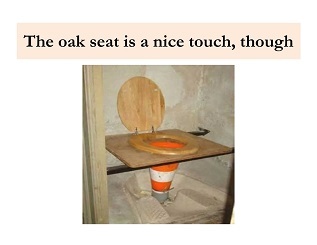 I did have one recently with new construction that the TP holder was actually too close to the toilet - you couldn't put the seat up! Of course, the builder corrected it after our first walk-through but, makes you wonder what they were thinking when they origially installed it that way.